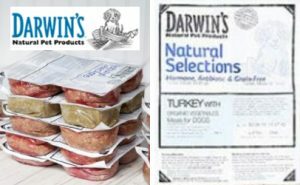 The U.S. Food and Drug Administration is cautioning pet owners not to feed their pets three lots of Darwin’s Natural Pet Food because products from these lots tested positive for Salmonella. These products are manufactured by Arrow Reliance Inc., doing business as Darwin’s Natural Pet Products, and are sold online direct to consumers through a subscription service. Salmonella can affect animals eating the products, and there is risk to humans from handling contaminated pet products, especially if they have not thoroughly washed their hands after having contact with the products or any surfaces exposed to these products. Healthy people infected with Salmonella should monitor themselves for some or all of the following symptoms: nausea, vomiting, diarrhea or bloody diarrhea, abdominal cramping and fever. Rarely, Salmonella can result in more serious ailments, including arterial infections, endocarditis, arthritis, muscle pain, eye irritation and urinary tract symptoms. Consumers exhibiting these signs after having contact with this product should contact their healthcare providers. People who think their pets have become ill after consuming contaminated pet food should first contact their veterinarians. Veterinarians who wish to have pets tested for Salmonella may do so through the Vet-LIRN Networkif the pet is from a household with a person infected with Salmonella. In addition, the FDA encourages consumers to report complaints about pet food products electronically through the Safety Reporting Portal or by calling their state’s FDA Consumer Complaint Coordinators. Customers who have any of the affected products should dispose of the pet food as regular garbage and contact Darwin’s for replacement by emailing productsafety@darwinspet.com or by calling 866-832-8319, Monday-Friday, 6am-6pm, Pacific Time; and Saturdays, 7am-3pm, Pacific Time.